Today we face the painful reality of the prevalence of chronic, rather than acute, diseases. The technologies developed to manager long-term, incurable illnesses have radically and irrevocably altered the organizational structure of health care, presenting us with a frequently bewildering array of medical specialties. 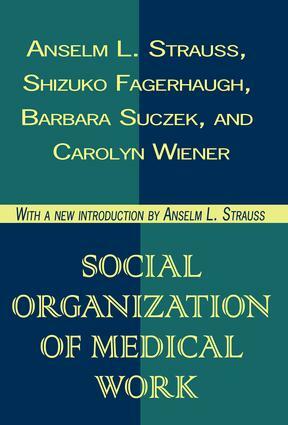 Social Organization of Medical Work offers essential insight into this new era of health care.Through richly documented, often gripping case studies, Anselm Strauss and his co-authors show us exactly how health workers are confronting the problems created by chronic disease and coping with today's highly technologized hospitals. They guide us through the various hospital work sites, describing in detail the kinds of tasks performed by medical personnel, the interactions of staff members with each other and with patients, and the overall resulting patient treatment and response.Focusing on the concept of illness trajectory, the authors vividly illustrate the complex, contingent nature of modern medical work. For example, open heart surgery keeps ill persons alive and may even improve them symptomatically, but those who do survive must face an uncertain future in terms of the physiological consequences of the surgery and the drugs required. They also have to adjust t altered lifestyles. In the new introduction, Anselm Strauss discusses the continuing importance of this work to sociologists, medical scholars, and medical professionals.